Republican state Rep. Daryl Metcalfe proclaimed his heterosexuality in an outburst after a male colleague touched his arm in a meeting. The Pennsylvania Democratic Party is asking state Rep. Daryl Metcalfe to resign. The demand was in response to a "random homophobic tirade" from the Republican politician, who recoiled after a Democratic colleague, Rep. Matt Bradford, touched his arm during a Tuesday meeting of the State Government Committee, which was discussing a bill on land use at the time. "Representative Bradford," said Metcalfe after the brief pat. "Look, I’m a heterosexual. I have a wife. I love my wife. I don’t like men, as you might. But stop touching me all the time." "Keep your hands to yourself," Metcalfe continued. "If you want to touch somebody, you have people on your side of the aisle that might like it. I don’t." "My intent was just to beg for your permission for about 30 seconds,” Bradford responded. Metcalfe replied, "Then beg, don’t touch." In a video of the diatribe, several people in the room, including Bradford, began laughing. Afterward, they seemed speechless. "I don’t know where we go from here," said an incredulous Bradford. In a statement posted to its website, the Pennsylvania Democratic Party declared that this most recent outburst from Metcalfe "has gone beyond the pale" and is a part of a history of homophobia and "repeated racism." “Enough is enough," said spokesman Brandon Cwalina. "Metcalfe is a walking, talking embarrassment to Pennsylvanians and doesn’t deserve the honor of serving in public office." "For years Metcalfe has taken policy positions based on bigoted misconceptions and fear of minority groups and the LGBT community, but today he has gone beyond the pale," Cwalina continued. "We are again calling on Daryl Metcalfe to resign and to apologize to all Pennsylvanians for his ridiculously bigoted behavior." 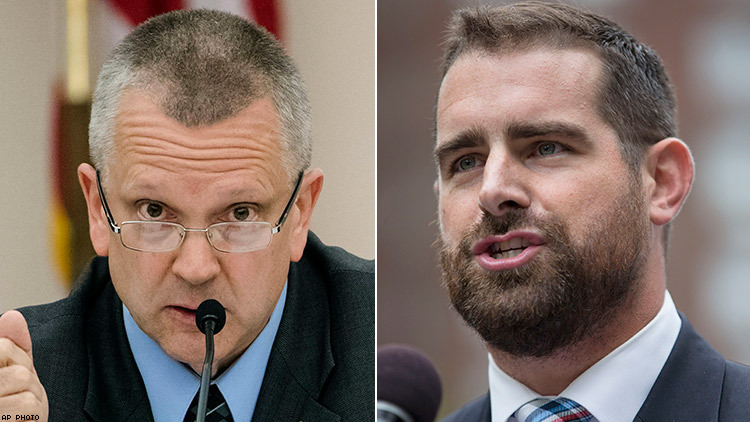 Brian Sims, the first out legislator in Pennsylvania, responded to Metcalfe's behavior with outrage on Facebook. "You can't make this stuff up! The most homophobic, transphobic, racist, sexist, xenophobic member of our government is using legislative time, and tax payer dollars, to interupt [sic] a meeting to announce his sexual orientation," Sims said. "THIS is what dealing with Republicans in Pennsylvania has become. THIS is why they're attacking our youngest and most vulnerable members of the LGBT community. THIS is what a broken moral compass, combined with gerrymandered, false leadership looks like," he continued. Metcalfe, of Butler County, has a long history of right-wing, antigay, anti-immigrant, and antiwoman positions. He is also the same legislator who famously blocked Sims from testifying on the House floor when the U.S. Supreme Court struck down the so-called Defense of Marriage Act. At the time, Metcalfe said allowing the gay elected official to speak would be an "open rebellion against what the word of God has said." At the time of this article's publication, Metcalfe has no plans to resign over his outburst, according to WPXI, a Pennsylvania NBC affiliate.